Personality: Melody is shy alot and hasnt had a good life. 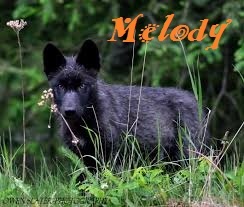 She shys away from other pups her age and wont talk around adults for fear of being scolded, other than that not many wolves know much about her. Other: The wolves she lived with before yelled at her and scolded her every time she spoke. 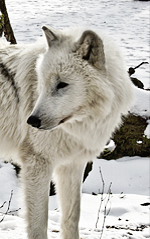 she gave up and ran off and nevered like to be around many wolves much. I stood there frozen, my legs numbed as i stared into the shadows with wide frightened eyes. There they stood with glowing eyes among the trees shadows. I heard one low grow, a warning that i better run? I don't think i'll find out now. They emerged one by one each ones muscle rippling like waves of the ocean. I stared in aww as they each emerged, i couldn't explain too you how beautiful they looked but also how deadly, i knew then that i was standing in the presence of a pack of wolves.